Mutualism: two organisms of different species in a relationship where each individual benefits from the activity of the other. Honeyguides in northern Mozambique know when a Yao hunter makes a special trilling sound, he wants to find a bees’ nest — and its delectable honey. They will often lead humans to a nest in exchange for some honeycomb. A honeyguide flies from tree to tree, calling and leading the person on, until the team reaches a bee nest. The person’s more risky job is to extract the honey from the nest. The partnership comes from complementary skills and deficits. Honeyguides excel at locating bees’ nests, but a bird that tries to steal some of the tasty reward could easily be stung to death. Humans have the skills and tools to dismantle the nests, and are less vulnerable to the bees’ stings, but compared to the honeyguides aren’t very good at finding the nests. 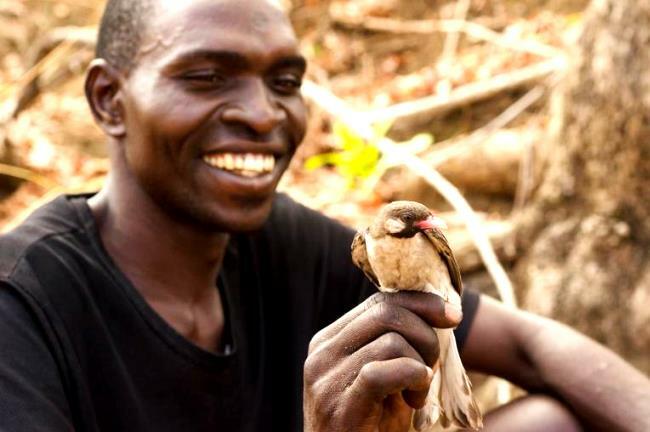 Though the science may be new, the relationship isn’t: Honeyguides and people have been cooperating in Africa for thousands of years. This entry was posted in Biology and tagged Africa, African Honeyguide, Bees, birds, Honey, Mozamboque, Mutualism, Yao Hunters. Bookmark the permalink.